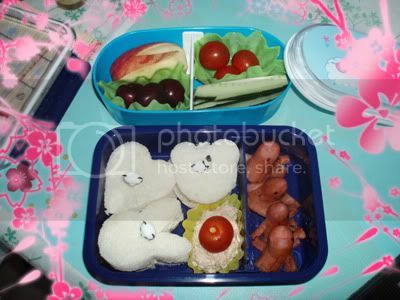 Tuna sandwiches cut into different shapes using cookie cutters, octopus sausages, cherry tomatoes, cucumbers, cherries and an apple bunny. Bento making is so much fun, isn't it? I've been packing bento almost daily for 2 years now, and they just make the middle of the day adorable. Also, 100yen shops rock. I think I recognize those sandwich cutters. Did you raid Daiso100 too?